Reference number for this case: 24-jun-54-Bretigny. Thank you for including this reference number in any correspondence with me regarding this case. In his book, French ufologist Aimé Michel had a footnote that the Bureau des Mystérieux Objets Célestes de l'Armée de l'Air ( the Office for the Mysterious Heavenly Objects of the French Air Force) tried in vain to explain an observation of a "flying balance" made in June 1954 by a test pilot of Bretigny. He refers the reader to page 139 of the book "Alerte dans le ciel." These two French ufologists note in their book that on June 24, 1954, at about 03:30 P.M., he pilot of a fighter jet "Ouragan" who was on the point of landing on the air force base ad test center of Brétigny sur Orge, started its turn when he saw two objects which moved in parralel with his own trajectory. He made a turn to intercept them and instead found himself 3 kilometers behind them instead of being closer to them. "Here is again a rather irritating story, and to which we could not give explanation." At 03:30 p.m., on June 24, 1954, a pilot of the flight test centre was on the point of landing his "Ouragan" jet under perfect conditions of visibility. The control tower had not indicated any other aircraft in the area. Whereas he started a turn, the pilot saw on the three quarter left front of his plane two objects which evolved parallel to his own flightpath. "I took them for two "F-84" in patrol. They roughly followed a 220° course. I decided to intercept them and I started a turn to catch up with them. This turn should normally have brought me at their level. I found myself, at my great amazement, 3 kilometers behind them! "I had never seen anything similar thing in the middle of the sky! The two objects seemed to me two ovoid fuselages, seen in end, and bound by a beam. Their spacing was 40 meters, their altitude 9000 meters. Although having used full throttle, I could not get closer. They were to evolve at a supersonic speed. And, strange thing, they were wobbling." Garreau indicates that based on the precise information of this report, the Scientific Office carried out several tests of reconstitution, and all that their investigators could establish according to the indications of the pilot, who had specified that the object filled three quarters of his front window, it is that actually this object was much larger or much nearer, and that in any event, it did not resemble any known aircraft or prototype. "Never did I see a similar thing in the middle of the sky: the two objects seemed to me as two ovoid fuselages seen from the end, and bound by a beam. Their spacing was of forty meters, their altitude of 9 000 meters. Although I put on full throttle, I could not get closer. They must have evolved at a supersonic speed. And, strange thing, they were dandled..."
Piloting an "Ouragan", a pilot of the flight test centre was on the point of landing. The visibility was perfect. The control tower had not indicated any other apparatus in the sector. However, whereas he started a turn, the pilot saw two objects which evolved parallel to his own trajectory, on the three quarter left front of his plane. "I took them for two "F 84" in patrol, he wrote in his report. They followed a course to 220 roughly. I decided to intercept them and I started a turn to catch up with them. This turn should normally have brought me to their level. I found myself, at my great amazement, 3 kilometers behind them. Never, the pilot continues, did I see similar thing in full sky! The two objects seemed to me two ovoid fuselages, seen from an end, and bound by a beam. Their spacing was of 40m, their altitude of 9000m. Although having given full throttle, I could not approach them. They were to evolve at a supersonic speed. And, strange thing, they were dandled." Basing itself on the precise information of this report, the scientific office carried out several tests of reconstitution. All that the investigators could establish according to the indications of the pilot, who had specified that the object filled the three quarter of his windshield, that this object was actually much larger or much nearer. In any case, it did not resemble any apparatus or known prototype. The strange machine, chased in vain by the pilot of the "Ouragan," was seen again on October 18 between Saintes and Royan, by two motorist. The two witnesses made an almost word for word identical description to that of the pilot: an object in the shape of balance which was dandled in the sky. two ovoid fuselage-shaped objects flying in formation. 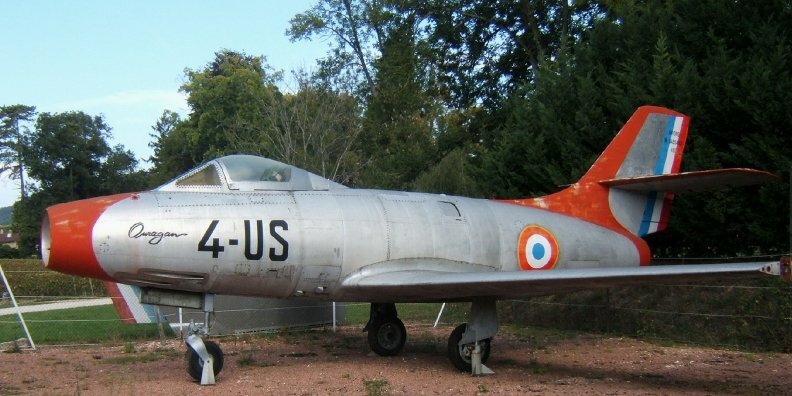 Luc Chastan indicates that in the Essonne in Brétigny sur Orge on June 24, 1954 at 15:30 hours, "Towards 15:30 the pilot of an 'Ouragan' was on the point of landing, started his turn and saw two objects which moved parallel to his own trajectory. He made a turn to intercept them and found himself 3 km behind them, instead of being at their level! 'The two objects appeared ovoid to me, seen from the end and limked by a beam. Their spacing was 40 meters, their altitude 9000 meters.' They moved at supersonic speed and were 'dandled'." The sources are indicated as "Face aux Extra terrestres by Garreau and Lavier ** DELARGE 1975" and "UFOs at Close Sight by Gross Patrick ** http://ufologie.net". The website indicates that on 23 June 1954 at 15:45 in Bretigny, France, "An unidentified object was sighted, but with appearance and behavior that most likely would have a conventional explanation. One object was observed by one witness for over three minutes. Explanation: Planet." The MD-450 Ouragan by Dassault (Below) was the first productive military jet plane of French construction, produced from 1951 to 1954. Propelled by a Hispano-Suiza Nene 104B engine of 2270 kg thrust, it was able to reach 640 km/h. [---] "Alerte Dans le Ciel", book by Charles Gareau, Grand Damier publisher, page 139, 1956. [am1] "A Propos des Soucoupes Volantes", book by Aimé Michel, reprint of "Mystérieux Objets Célestes", Planète publisher, France, 1958. [gl1] "Face aux Extra-Terrestres", book by Charles Garreau and Raymond Lavier, Delarge publisher, France, page 238-239, 1975. [hi1] "Les Débarquements d'Humanoïdes", article by Charles Garreau, in "Les soucoupes volantes", Historia magazine, France, #46, special issue, page 72, 1976. [am1] "Mystérieux Objets Célestes", book by Aimé Michel, Seghers publisher, France, page 261, 1977. [---] "Alerte dans le Ciel", book by Charles Garreau, Alain Lefeuvre éditeur, publisher, 1981. [ce1] Summary on SITOVNIS, the web site of the French ufology association C.E.R.P.H.E., circa 2001. [dw1] "Unidentified Aerial Phenomena - 80 Years of Pilot Sightings", Catalog of Military, Airliner, Private Pilots' Sightings from 1916 to 2000, by Dominique F. Weinstein, NARCAP International Technical Advisor, 6th edition, February 2001. 1.2 Patrick Gross December 4, 2016 Addition [ub1].